Intel wants to win the battle for your body with the smallest ever wearable computer called Curie, which is so tiny, it was barely visible to the audience during an on-stage demonstration. The button-sized computer will go into different types of wearables, even tiny coin battery devices that typically run for days and months, said Brian Krzanich, CEO of Intel, during a keynote at the International CES in Las Vegas on Tuesday. “This product—they can deliver wearables in a range of form factors,” Krzanich said. It could go into rings, pendants, bags and “yes, even buttons on our jackets,” he added. The Curie chip was demonstrated fresh out of Intel’s labs. 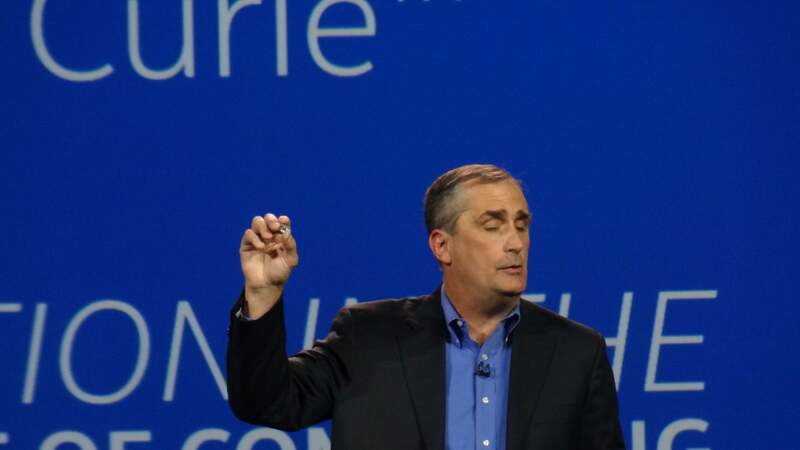 Krzanich demonstrated the chip tracking his steps and heart rate during the keynote, and the results reflected on a smartphone. Wearables have dominated the show floor at CES, with a plethora of smartwatches, fitness trackers and augmented reality headsets. Intel wants to put its circuitry in those devices, whose shipments are expected to touch millions in the coming years. Intel has made its name in laptops and desktops, but is looking to step into adjacent markets like wearables to sell more chips. CEO Brian Krzanich holds up the Curie. Intel sells one wearable called the Basis Peak smartwatch through a subsidiary. But it prefers to pursue wearables through partners, and at CES, the company announced a partnership with Oakley to bring smart eyewear to athletes. Its technology has been used in SMS Audio’s BioSport earphones and Opening Ceremony’s smart bracelet. It’s not clear if the products use Intel’s chips, but the wearables have software technology developed by chip maker. Intel has also partnered with Luxottica and Fossil Group to build wearables. The power-efficiency and minuscule size of Curie could give Intel a legitimate shot to compete in wearables, a market in which ARM and MIPS also play. Intel’s road to wearables previously was through the Edison chipset, which was announced last year and is the size of an SD card. But instead of wearables, Edison instead found its way into more robots, drones and electronics. The Curie chip is based on the extremely low-power Quark chip and has Bluetooth wireless communication capabilities.. It has a sensor hub so wireless devices can track activities like steps. The rest of the keynote focused around the ease of computing and the evolution of PCs into more interactive systems. Computers are gaining senses, and can see and hear, and will be able to understand and add context to situations and surroundings, Krzanich said. He gave an example of its 3D depth-sensing RealSense camera recognizing gestures and assisting in chores. The cameras can also give eyes to drones, which would be able to navigate freely. Robots will get autonomy and also safety through vision and the ability to analyze situations. In a demonstration called “The Game of Drones,” Intel showed a drone going through an obstacle course. Intel also wants to make PC usage free of wires. Tablet and PC users will be able to recharge, transfer data, send print requests, or even connect to monitors and printers without cables. “You no longer will be chained to your computer by wires,” Krzanich said. A demonstration showed a tablet being charged wirelessly after it was put on the table. Intel is partnering with Marriott to bring wireless computing to hotels later this year. Other Intel partners for wireless computing include Hilton, Dupont, Emirates and San Francisco airport. At the keynote, HP also announced that it would use Intel’s Core i7 chip in its first 3D printers called Multi Jet Fusion. The 3D printer will require a lot of processing power because of a complicated multi-step process to create 3D objects.